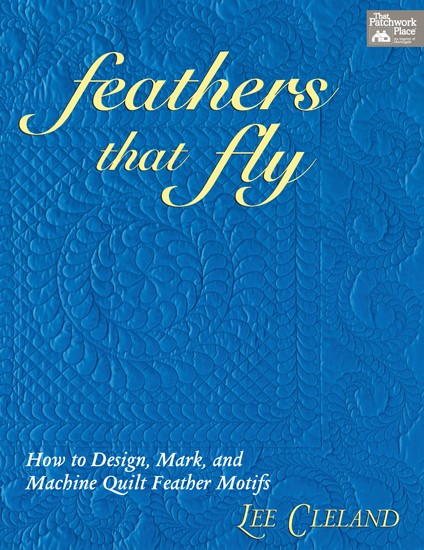 This is a GREAT book for a beginning machine quilter! 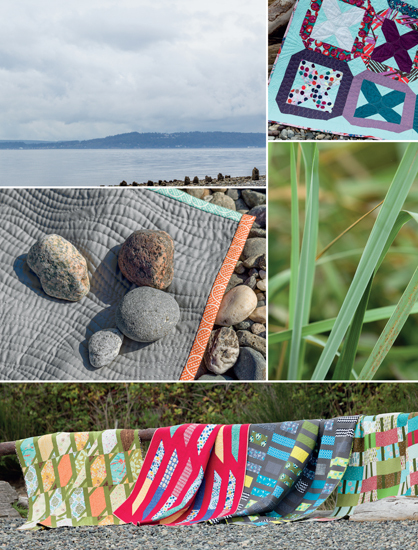 Lee gives you 14 projects from which to choose that will have you making a quilt top and then quilting feathers all over as you follow along with her detailed pictures and instructions. 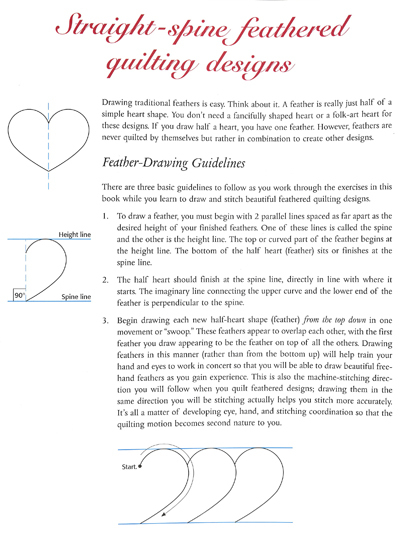 She starts with a basic design and explains it in layman’s terms (think of hearts when you stitch feathers). Her designs go from simple to complex. 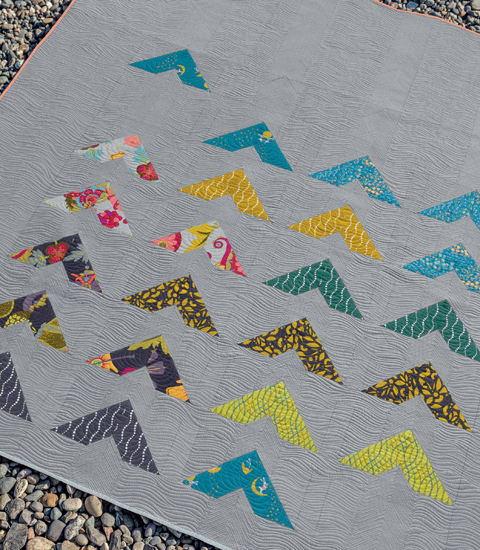 You can’t imagine my surprise when I found the Intertwining Double Feather Repeat Design – as a professional quilter, I have not yet done this so I did not know how to quilt it. It looks much like the picture below, with the curved “cables” intertwining with the feathers (don’t want to scare you off!). It’s pretty cool! 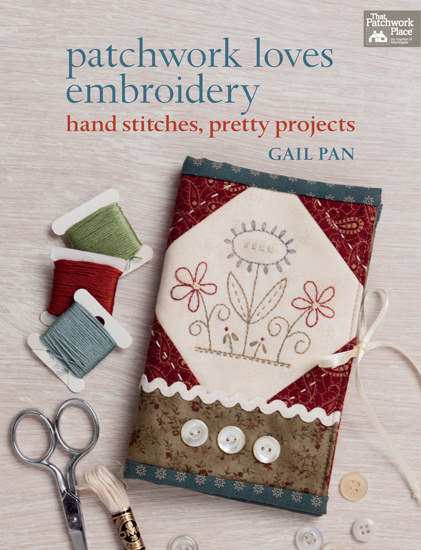 I think embroidery is coming back into vogue, and this book provides the cutest whimsical patterns by Australian designer Gail Pan. I have found the most amazing embroiderers to be from Australia, Japan, and Europe. We need someone from the USA now to take the lead! 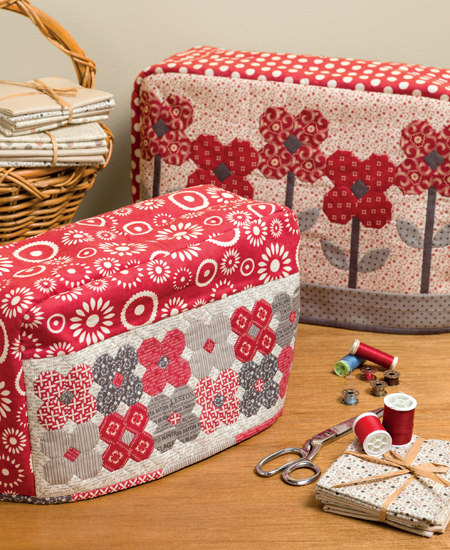 😉 There are 15 patchwork and hand-embroidery projects, all of them small enough to take with you for hand-work. I found all of the projects could be made as nice gifts for others (or yourself!). 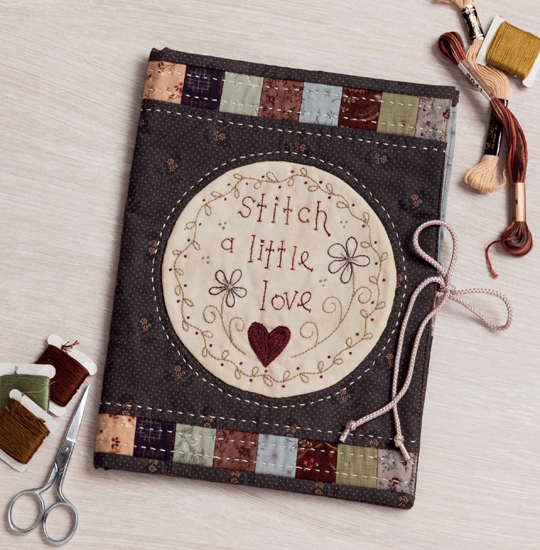 In this book, Gail shows you the basic stitches that are used in her patterns. 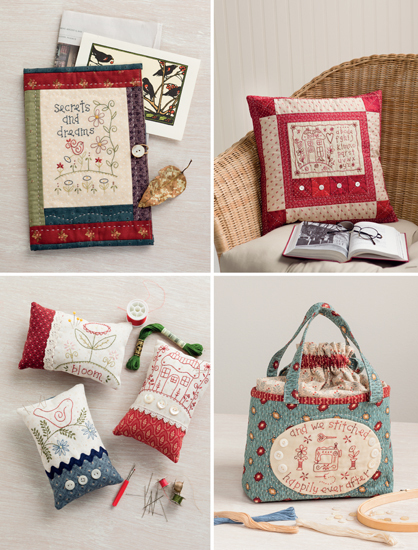 Check out these projects and see for yourself if you’d like to take up hand embroidery. See how you could easily take a checkerboard quilt and add embroidery to make it something extra special? 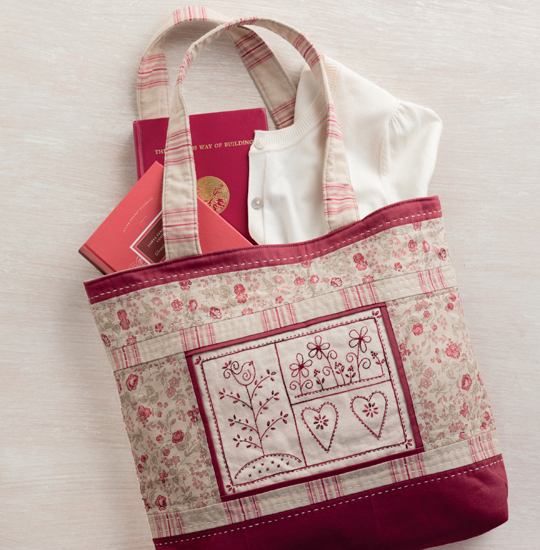 Look at the adorable bird in this redwork bag! This is a little folder for your embroidery supplies. 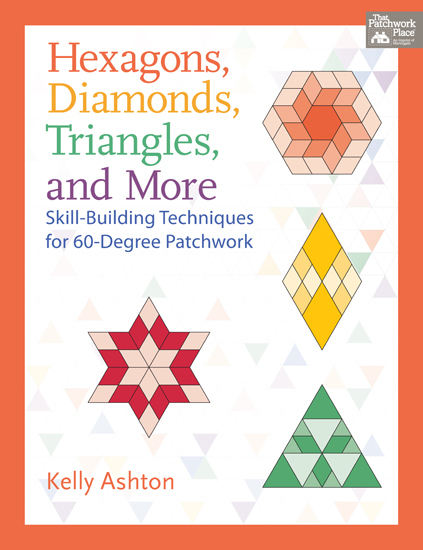 Funny, Kelly was just visiting our guild meeting this morning with this book! 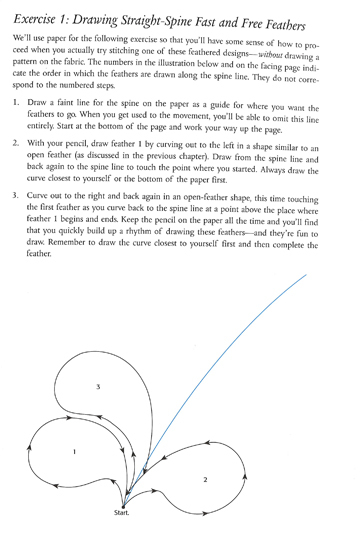 She has got to be a math genius, because she has provided about 80 designs in this book and has done all the calculations and measurements for us. Now we can just cut out our fabric and start stitching. No more measuring and cutting wrong, re-measuring and cutting right we hope, and then stitching. 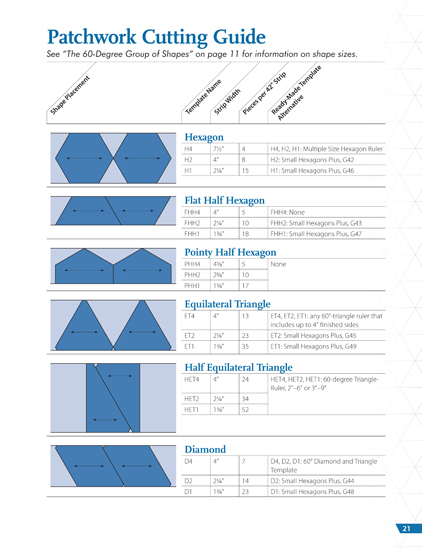 There are 9 pages of templates. If you’d rather have thick, commercial templates, she gives suggestions for which ones to purchase. 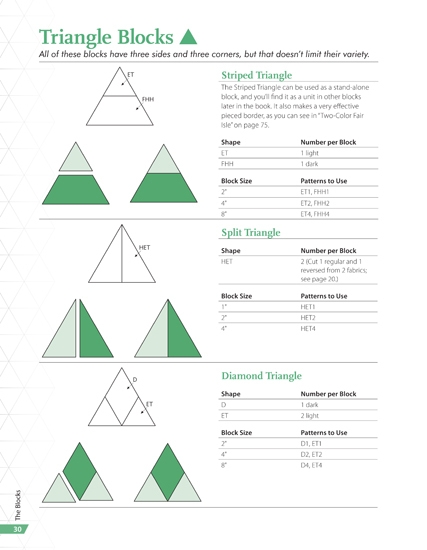 This is a great reference tool that will help you for years to come. 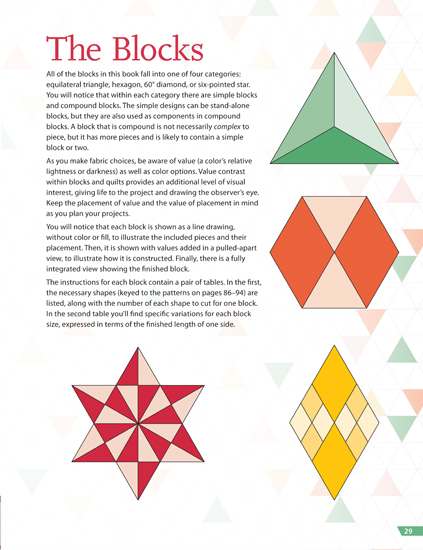 In this section (above and below) she breaks it into chunks of information with visuals so you can see for yourself how the shapes in the blocks break into smaller chunks. For example, she shows you a tumbling block within a 6-sided star. 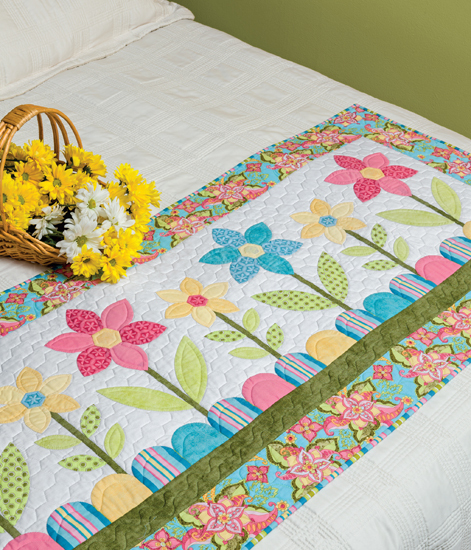 Part of this section shows how to values make up and show off the different shapes for a stunning quilt. If you look at the table topper below, the Y-Seams might intimidate you, but Kelly shows you how to do them, step-by-step. 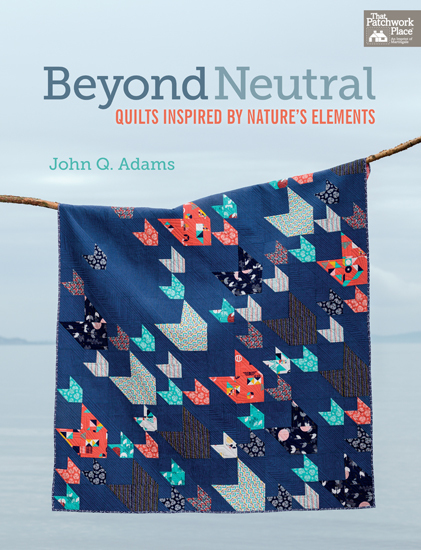 In this book, John (obviously from the title) uses colors from nature to create quilts, but he goes one step further and takes objects from nature to use as the shapes in his quilts. 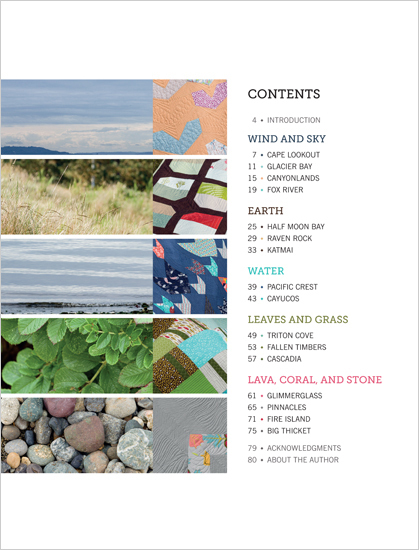 The book is broken up into sections that incorporate wind, water, earth, leaf, sky, grass, lava, coral, and stone as they apply to nature. 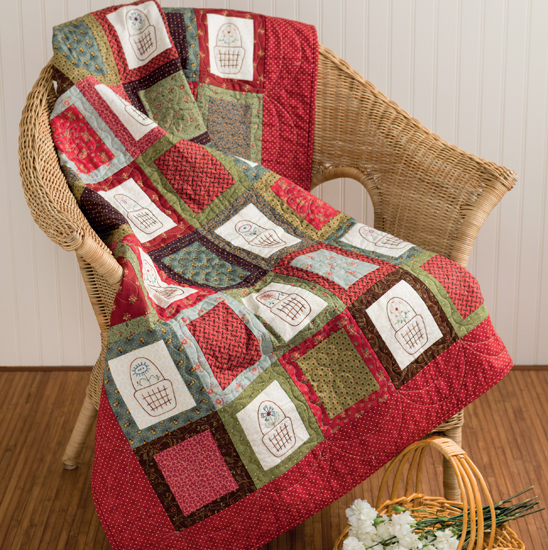 As I looked through this book, I felt comforted by the serene backdrops and the soothing feel of being surrounded by nature and wrapped with love in one of these quilts. 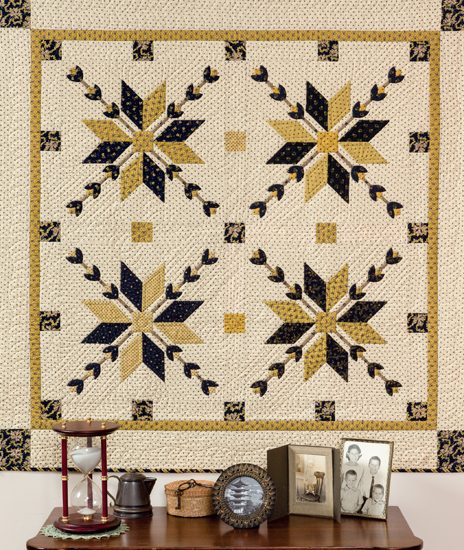 When I look at the quilt below, I can see the sandy beach and the waves of water. 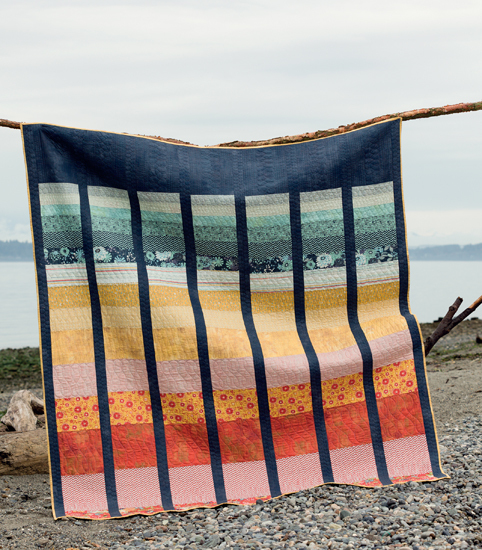 If you turn the quilt the other way, the sandy beach can become a sunset. Do you see it? This reminded me of birds on a cloudy day. John used some interesting colors for his background fabrics, moving beyond neutral-colored background fabrics that we have come to expect in traditional quilts. 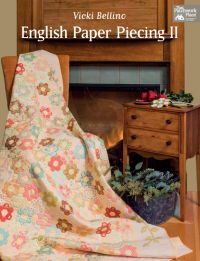 This is a follow-up to her best-selling book English Paper Piecing and includes 11 projects, from a tote bag, table runners, sewing machine cover, and quilts. 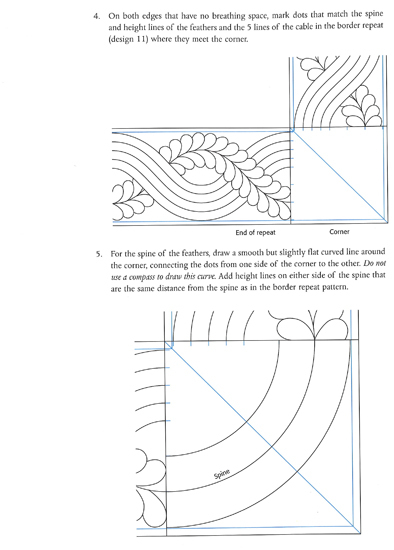 One thing I noticed about this book is that it seemed to move beyond traditional paper piecing and incorporated the same techniques for applique; sort of like paper piecing with a twist. Here’s the tote bag. 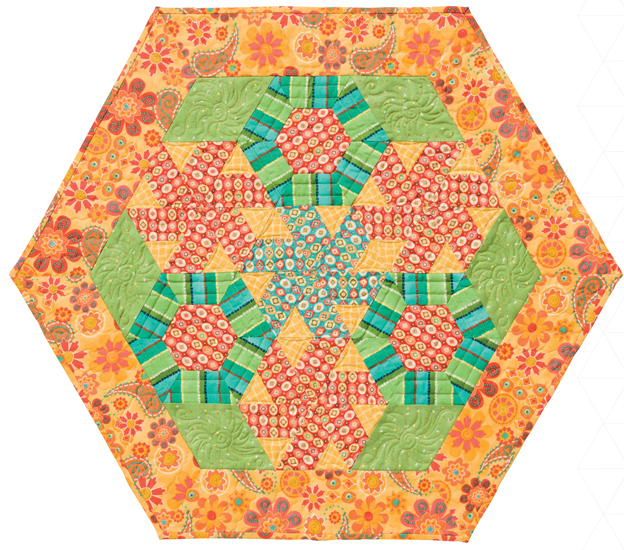 I’d love to have a Grandma’s Flower Garden quilt, but to be honest, the thought of paper piecing that many small hexagons together scares the bejeezus out of me. 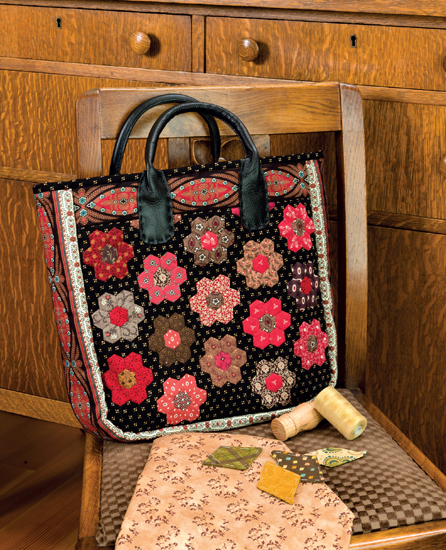 I think I can manage to have a taste of Grandma’s Flower Garden with a tote bag, though. That’s it for now. Stay tuned for June’s book reviews sometime in this life time. Just kidding!